Novel attacks continue to appear against in-vehicle networks due to the increasing complexity of heterogeneous software and hardware components used in vehicles. These new components introduce challenges when developing efficient and adaptable security mechanisms. Several intrusion detection systems (IDS) have been proposed to identify and protect in-vehicle networks against malicious activities. We describe the state-of-the-art intrusion detection methods for securing automotive networks, with special focus on the Controller Area Network (CAN). We provide a description of vulnerabilities, highlight threat models, identify known attack vectors present in CAN, and discuss the advantages and disadvantages of suggested solutions. This is a manuscript of an article published as Young, Clinton, Joseph Zambreno, Habeeb Olufowobi, and Gedare Bloom. 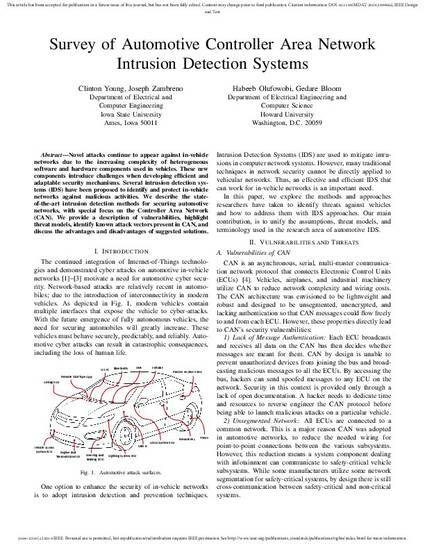 "Survey of Automotive Controller Area Network Intrusion Detection Systems." IEEE Design & Test (2019). DOI: 10.1109/MDAT.2019.2899062. Posted with permission.